Tasty, Aromatic With Numerous Uses. This is definitely my favourite herb! But exactly what is cilantro and how do you use this delicate, most fragrant of herbs? This herb, coriandrum satvium, is an annual and a member of the parsley family and as such can easily be mistaken for flat leaf parsley. In fact, parsley is just about acceptable as a substitute for cilantro, just don't expect your dishes to be anything like if you had used the aromatic real thing. Sometimes called Chinese parsley, this herb is native to the Mediterranean and southwestern Asia, but is now grown throughout the world. In a lot of the English speaking world the whole plant, leaves and seeds, is known as coriander. Whilst in places like North America it's commonly called cilantro which is Spanish for coriander. Unusually the plant is a herb AND a spice, the delicate leaves are the herb part and the seeds the spice. It's these cilantro seeds that are the base to a lot of my spice blends on this site, and all my curry powder recipes use the seeds. If you really want to extract the most flavour from the seeds, then it's a good idea to toast and grind them first. See the cooking with spices page for "step-by-step" info and photos on this process. The fresh cilantro leaves work well in many foods, chutneys, salsa and relishes in particular. But for me, it's stir frys and curries that really make this herb come alive, added just before serving or sprinkled on top as a garnish, giving your prepared dishes a unique twist. You may have heard of Thai green curry paste? Well this tasty base for curry recipes uses the cilantro root amongst its ingredients. Also in Thai cooking the roots are extensively used in soups. 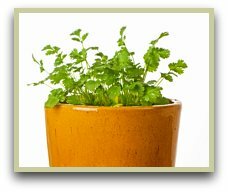 So now you know what is cilantro, how about growing some? Just sow some seeds in a sunny spot in well-draining soil, and in 4-5 weeks you'll be harvesting the delicate young leaves. Let them flower, and at the end of summer you can harvest the seeds. Click here for quick tips on how to grow this herbs. Once grown, not only is it excellent for flavouring your cooking, but the seeds and leaves have a ton of health and well-being uses. Read more on the many health benefits. Info on What is Saffron - It takes 75000+ flower heads to produce a single pound! What is Cardamom Spice - All you need to know about the "Queen of Spices"